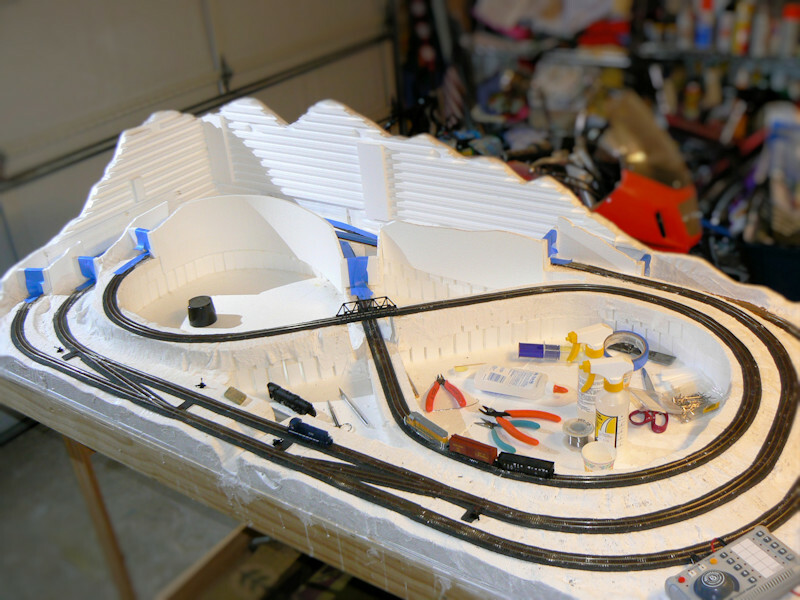 This is part 3 of a series of articles about N scale model train building.In the previous article about Laying Track I placea bunch of styrofoam risers and profile boards for my N scale track.This article is a continuation of laying track and getting it ready to run some trains. 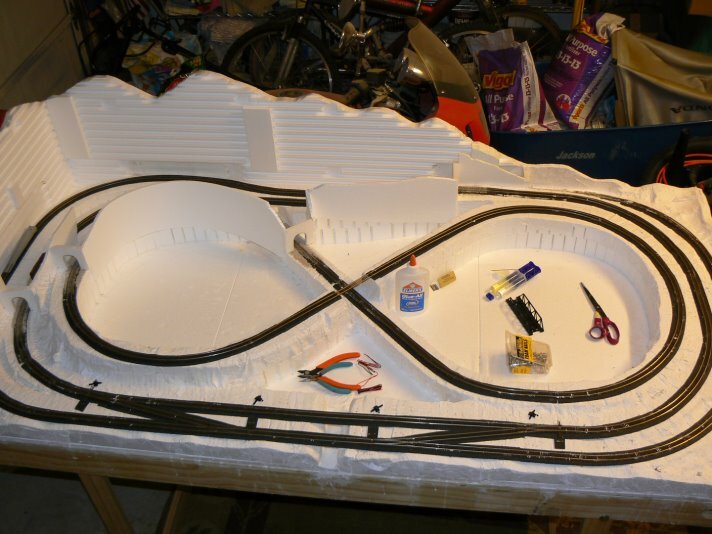 Note also that I have some plaster cloth under some of the track areas.This is the same plaster cloth that doctors used to set a broken limb.It is fun to use it and make mountains and hills and gullies. In this photo I have removed the pins from the track and set upa transformer to run some trains.In the photo you will see a Union Pacific (yellow and gray) GP 40 pulling a fewcars and a Missouri Pacific "Mopac" (dark blue) MP 15.These are both engines that are common or one time used in Austin, Texas. You might also note a Bachmann Digital Command Control (DCC) controller at the bottom right.This transformer can control and send signals to 10 or more locomotive engines.For those model train old timers who used to use switches and multiple circuits on a track,this type of DCC operation really simplifies your train set.You have one live track circuit and many smart locos that only react to signals yousend to it.It is lots of fun to play catch up and dodge em with all the trains running on one track. Also note that I have the tunnels taped up. 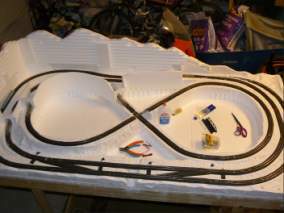 The next step is to make the tunnels dark. 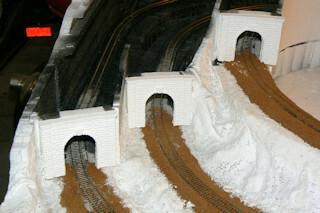 This photo shows the tunnels painted black for spooky scary tunnel rides.Be sure to use a water based spray paint such as Krylon H20 or RustOleum plastic paint, orelse any spirit based solvent will eat away the foam. Woo hoo, also notice the Santa Fe (red and white) Super Chief F2 engines pulling the four passenger carsacross the bridge.Both the A and B units are powered and both respond to the same commands.What is nice about this arrangement is that having two units makes this a very powerfulpulling unit. I will someday get more passenger cars for this train.Additionally, this combo is the smoothest running loco in my stable.If ever the A or B unit hiccups on some dirty track, the other unit will push or pullthe train to safety. Since the layout has limited space and no border, I made a little wooden pocket formy DCC controller.This one is made from some bass wood lumber available at many hobby shops. You can see this controller has a big throttle knob anda few buttons for direction.On the right side is a 10 button pad for quickly selecting one of 10 locomotive engines.They give a little window with a card for writing out loco names.Since I don't envision having more than 10 locos, I have no problem writing inall the engine names. I did not like my initial ballasting attempt with the light gray ballastgiven in the Woodland Scenics kit.I took a peek at some of Austin's train tracks, and I noticed the ballastwas a mix of tan, gray, off white, and some black aggregate.It seemed to be a mix of sandstone, limestone, and other cheap rocks.The predominant color was tan, so I bought some new ballastand redid my earlier ballasting. 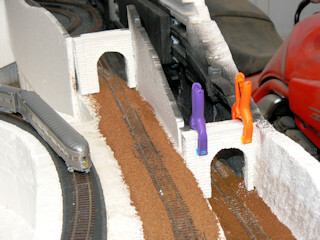 As I mentioned before, here is my technique for ballasting.Using a funnel or paper cone, place the dry ballast over the track and bed.Then use a flat brush to get the ballast off the rails and ties.Then I use two nalgene squeezy bottles to wet and glue the ballast.The first bottle has a mix of 70% water and 30% isopropyl alcohol.Drizzle this lightly over the ballast and try to soak the ballast withoutblasting it or pushing it all over the place.The second bottle has a bit of scenic cement or simple white glue dilutedwith water. 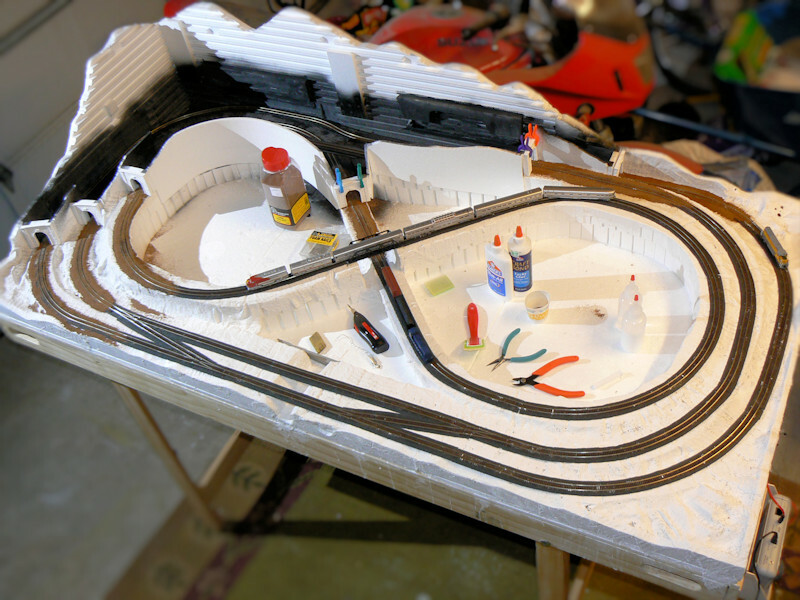 The glue should be the consistency of whole milk.Drizzle this onto the wetted ballast.Let it dry overnight and by the next day you can vacuum and clean upany dirty rails. Lastly, notice the "random stone" portals that are now facing the tunnel entries.These castings are from Woodland Scenics and are made with their lightweight hydrocal,a fancy name for Plaster of Paris.I had to saw down the stone with a Dremel tool to get them to fit in the tight layout. 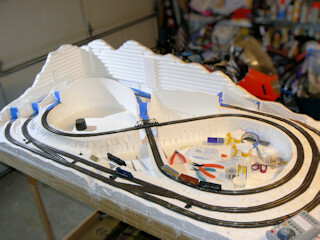 The other side of the layout has three portals in a row.This is a fun design feature.When you are running trains they enter and exit the tunnels,sometimes in unison, sometimes in opposition, somewhat randomly.It is a strange thing deep in the human psyche that weare so curious about things appearing and disappearing in our view. 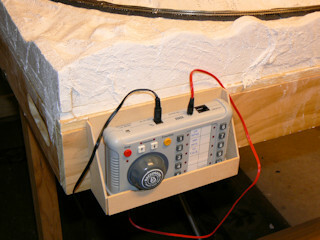 The photo also shows the unpainted plaster cloth and portals just waitingfor some sort of earth colored wash.
Last modified: Thursday, 09-Jun-2011 13:08:26 MST.